I love writing about what I’ve eaten for a day, but lately I’ve been in a bit of a food rut. I have no problem eating it! Don’t get me wrong. I just eat basically the same things, day in and day out with no variety, so you can imagine the sheer glee and delight I experienced when a friend invited my fiancé and me over for a lovely vegan dinner. My friend, James, is no vegan freshman. He’s a pro, and I knew he’d bring the vegan fire with him. He did not disappoint. So I have so many yummy goodies to share! But first, breakfast. I know … that was some kind of tease. I went past foreshadowing into full blown sunshine. 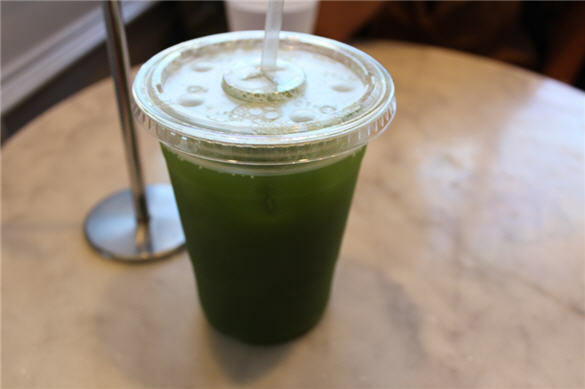 For my first meal of the day, I had an alkaline treat that I used to have during my lovely alkaline challenge. 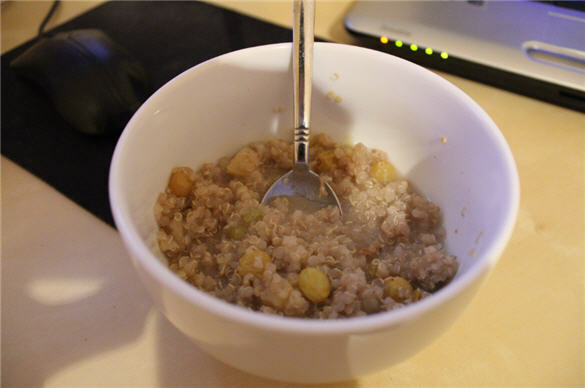 This dish consists of quinoa, apples, cinnamon and rice milk. 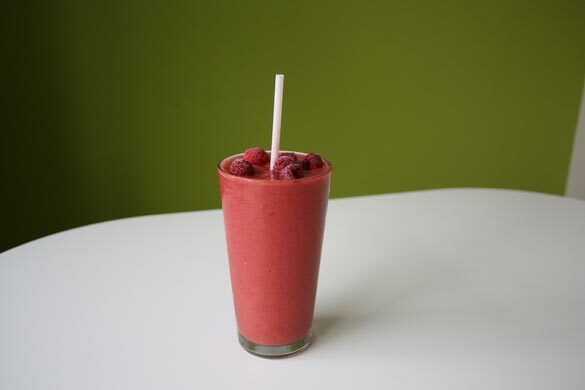 For someone who usually has a smoothie for breakfast, this is a welcomed change. Sometimes (even in the summer) you need a good warm bowl of something in the morning to get you going. For lunch I met up with a friend and her little one for one of my favorite salads and drinks. 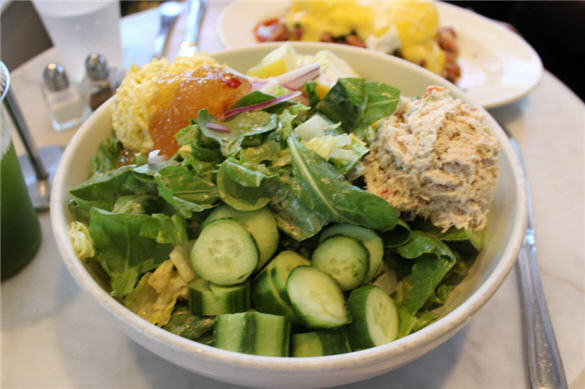 Charlie’s Pantry in Studio City, Calif., makes the best dishes. I warn you. You will enter, look at the board, switch to the display of side dishes and freeze. Very difficult to decide what to get. My advice: dig in! At first I was all over that menu. This time it was all about the Kashmir Salad. One avocado half is filled with tuna, the other one with curried egg. Then there’s heirloom tomatoes, cucumber salad, romaine lettuce, arugula, mango chutney and lemon-chili dressing. It’s the stuff salad dreams are made of. Every time I’m there I HAVE to get the Jamaican Popeye. It’s spinach and pineapple juice. That’s it! No added sugar. Just two simple and beautiful ingredients that are extremely refreshing and invigorating. My snack for the day consisted of my protein smoothie. I’ve switched to a new protein powder that I love: Vega Sport. Plant-based goodness I tell ya. I rarely mix up the fruit selection: banana, blueberries and cinnamon do it for me! But the best meal of the day would have to go to the vegan dinner. James and Evan were so gracious for opening up their home to us. I love conscious eaters! I love hearing about the research and thought that goes into planning meals, and I really adore people who love to make sure they’re getting the nutrients they need. (Vegans can eat unhealthy, too! It’s totally possible.) 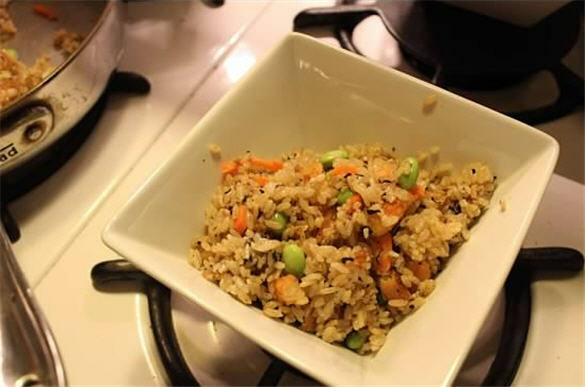 We feasted on a vegan “shrimp” fried rice dish that blew both my and my fiance’s mind. Mr. “I need meat!” wasn’t complaining. It was delicious. Full of different and fun flavors and fulfilling. One bowl and I felt lovely and perfectly fed. There was siracha in that wonderful bowl, and I didn’t even sweat. 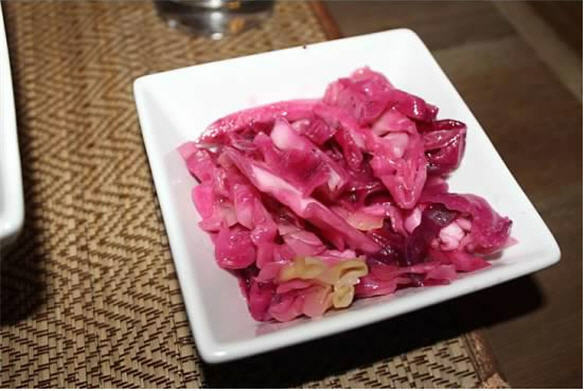 We also had a great cabbage salad that consisted of purple cabbage, red-wine vinegar, Stevia, salt, pepper and olive oil. It was deliciously crunchy and paired oh-so-nicely with the “shrimp” dish. For dessert our guests served up the most simple yet delicious chia seed pudding. Apparently very few Americans get the correct amount of fiber they need in a day. (This was the awesome conversation we had. Man, I love dining with healthy humans!) Adding chia seeds to a meal or beverage could help us all. 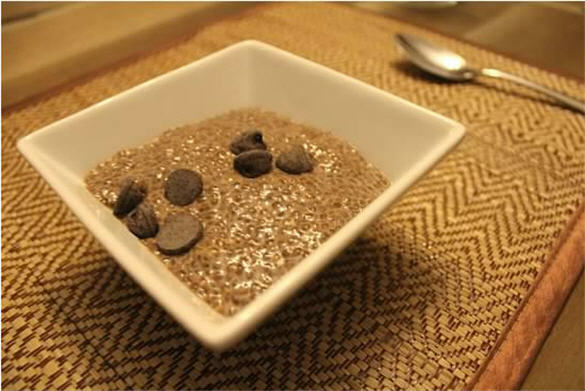 I will be making chia seed pudding in the very near future. It was rich and delicious. P.S. Those are Ghirardelli dark chocolate chips. Heaven can be found in pudding. Who knew?! James did an amazing job with these dishes. We can’t wait for our next dinner date! 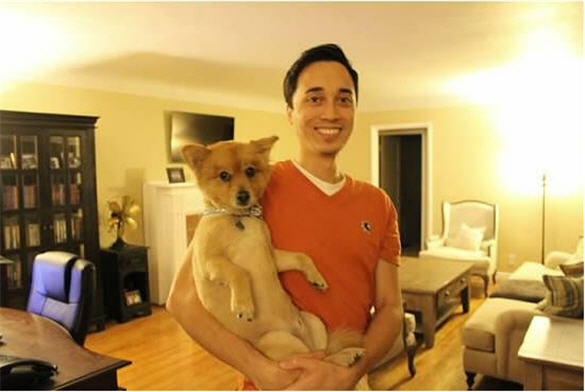 He hopes to complete a vegan cookbook by the end of 2013. When that happens, I shall share this glorious work with you all. When something’s this good, you have to share with your friends. Vegan, vegetarian, meat-eating … it won’t matter. You’ll love these dishes! That “shrimp” fried rice looks ridonculous. How do you make it? What do you use for the shrimp?